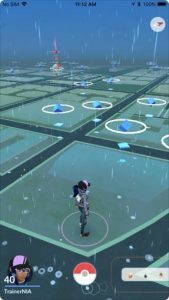 The newest update to Pokémon GO, the global gaming sensation that has been downloaded over 750 million times and named “Best Mobile Game” by The Game Developers Choice Awards and “Best App of the Year” by TechCrunch, introduced a dynamic weather system that recognizes real-world weather, impacting the gameplay experience in a variety of ways, from changing the Pokémon encountered to increasing their effectiveness in combat. Information current as of December 6, 2017. Compatible with iPhone® 5 / 5c / 5s / SE / 6 / 6s / 6 Plus / 6s Plus / 7 / 7 Plus / 8 / 8 Plus / X devices with iOS Version 9 or later installed. If you use Pokémon GO with your Apple Watch, with your consent we use the Apple HealthKit APIs to read and/or write certain data (such as Step Count, Calories Burned, and Distance Walked) to the Health App Database on your device (the “Health App Data”).